Small house in the Tuscany hills, is ideal for families or groups of friends who want to share their holiday without giving up their privacy. At ground floor: 2 apartments Bilo and Trilo which if necessary can be combined to form one large apartment for 6/10 people. A first floor with entrance from the outside there is a large apartment consists of three bedrooms, 2 bathrooms, living room with fireplace and large terrace for outdoor dining for 6/7 people. The outdoor is well cared for, every apartment has a small private gardens. The pool is set in panoramic location on the rolling hills that lead from Pisa to Volterra. 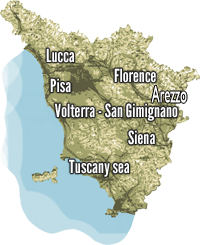 The location of the farmhouse is centrally compared to the art cities of Florence, Pisa and Volterra, all accessible in less than 1 hour. In the warmer evenings the hosts like to offer their guests a taste of good Italian pizza. The whole house have a capacity of 12-17 people. All ground floor apartments became one big apartment and the guest can share the large livingroom with kitchen or eat outdoor under the shadow veranda.